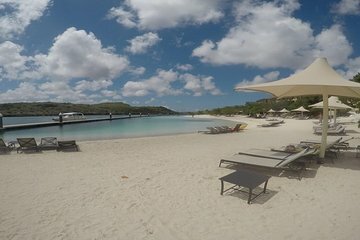 Faites une excursion d'une demi-journée en bateau sur la côte de Curaçao avec un guide privé. Naviguez dans la lagune espagnole pour admirer des superyachts et des maisons de plusieurs millions de dollars le long de la voie navigable. Vous aurez également le temps de faire de la plongée avec tuba et une pause à la plage où vous pourrez déguster un cocktail ou des collations. First and foremost, our captain, Arnold, was outstanding! Thank you for that. He was insightful, helpful and fun. OK, we had six of us. Two parents, a 21, 20 18 and 5 yr old. My expectations were to do a good snorkel, get a good ride and enjoy a lovely beach and grab some lunch with the fam. The excursion is 3 stops. The first was snorkeling the tug boat. The water was awesome and beautiful. Soooo clear. Plenty of fish and all of this was enjoyed. The second part was a tour of the ritzy area of Curacao bay area. Yachts and lavish homes. Not my cup of tea. Arnold pointed out a bunch of homes, yachts and landmarks. The third part of the excursion was to hit a beach. The beach we went to was a stretch of shoreline in the bay. But, the beaches were private for the respective hotels and you couldn't use chairs or umbrellas. Plus, there was a dock that ran along the stretch of shoreline. It wasn't what I wanted and didn't feel like it was a beach in the middle of the Caribbean. We had fun for sure, it was just an expectations issue. So, at the end we personally felt that for the $850, it was quite short on value. Again, Arnold was awesome. We found out that his passion is Sea fishing. I think we would have had more fun spending $850 with Arnold fishing. Super cool dude.